As we know development in F1 is relentless and so Mercedes continue to tune the W05 based on general R&D and circuit characteristics. For Suzuka the team have introduced a detached floor scroll (above), it's something we have seen other teams use with Lotus and Red Bull being the most notable examples. The scrolls in this region are used to control how both the airflow that comes around the front face of the sidepod then migrates around the floor surface to the rear of the car and how the front tyres wake impinges upon this and the performance of the underfloor/diffuser. It's easy to only think of the wakes influence with the tyre facing straight ahead but we must remember that it's when the car is cornering that downforce is at a premium. This means that the wake is constantly evolving dependent on the cars attitude meaning you need components to work over a wide performance threshold. 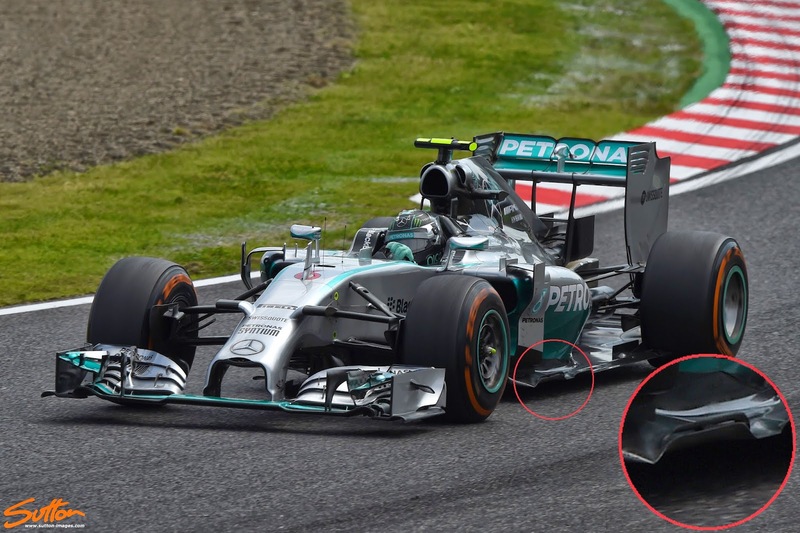 Much like the perforated gurneys used above the Diffuser the scroll allows a small quantity of airflow to be injected, effectively increasing the scrolls angle of attack and aspect ratio, making it more efficient over a wider speed range. Meanwhile with two flow regimes rather than one, different vortices will be formed, changing how the airflow structures in the region operate. As usual, outwardly the change may seem minor but it's performance can have widesweeping ramifications up and downstream. 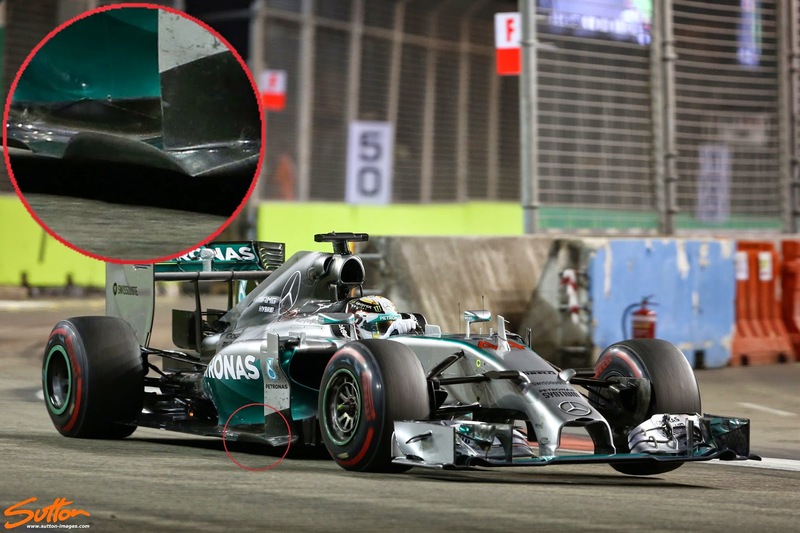 Above: In this image from Singapore we can see that the team have been using a singular scroll in the region. The team also made a revision to their airflow conditioner, which is now mounted to the bargeboard rather than the floor.